They bob playfully on summer breezes, illuminate landscapes with polka-dot allure and consistently remind me of blue-haired old ladies with perms. They are hydrangeas – one of the oldest and most cherished stalwarts of the traditional garden. I adore them. They are out in force now. Having begun their sunny blooms in mid-July, they will last almost until the end of August, gussying up the gardens of their fans with their glorious orbs of flowers. The virtues of the hydrangeas are too numerous to count: they do well in sunny spots and partial shade; they thrive in warm planting zones and cool ones, depending on the variety; they look stunning in flower arrangements as fresh flowers and can be easily dried for dried-flower arrangements. I suppose the only real downside to the hydrangea is that it is without any scent. It seems to me a cluster of blooms like that really ought to be as fragrant as they are showy. But, alas, they are fragrance free. One of the best sources I’ve found on the web about caring for hydrangeas is called, quite simply “Hydrangeas! Hydrangeas!” at http://www.hydrangeashydrangeas.com/. There you will find tips on pruning, planting, fertilizing, cutting, drying and arranging hydrangeas, as well as a comprehensive description of all the various types of hydrangeas that exist, their planting zones, their special care instructions and galleries of their long-lasting blooms. 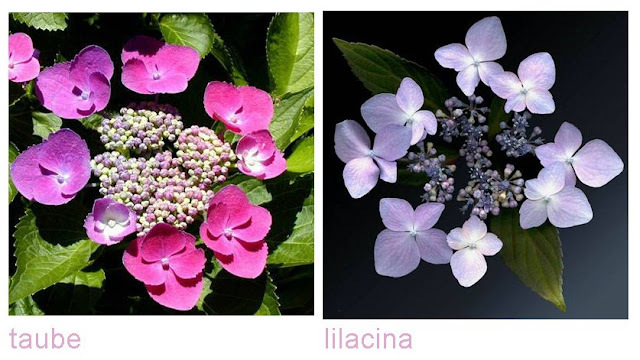 If you’re a hydrangea lover, as I am, I urge you to visit the site and get the details on your favourite varieties. Below are some photographs I’ve taken of some of the hydrangeas in my neighbourhood. 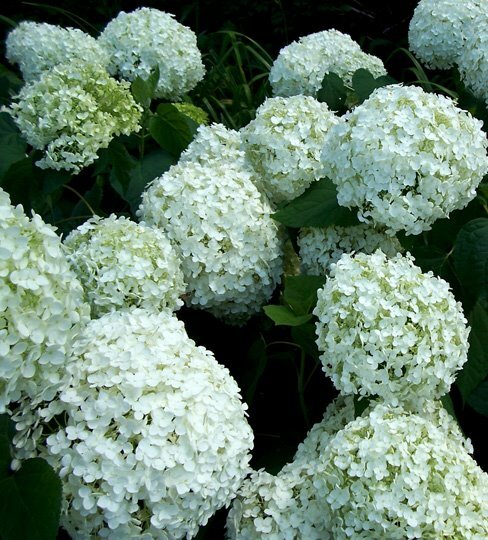 Most of them are white “Annabelle” varieties, the most common hydrangea. Below these are images of the more elaborate, rarer varieties, which are so beautiful. 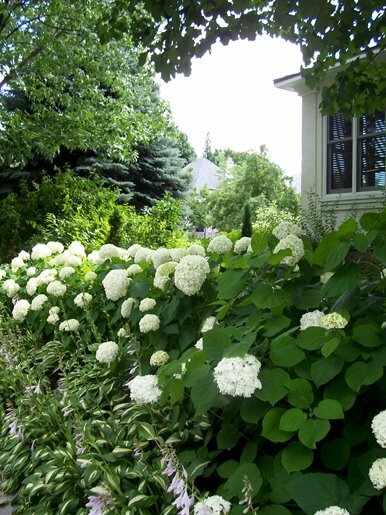 Above, is the typical "annabelle" hydrangea, planted in a long row next to some flowering hostas. 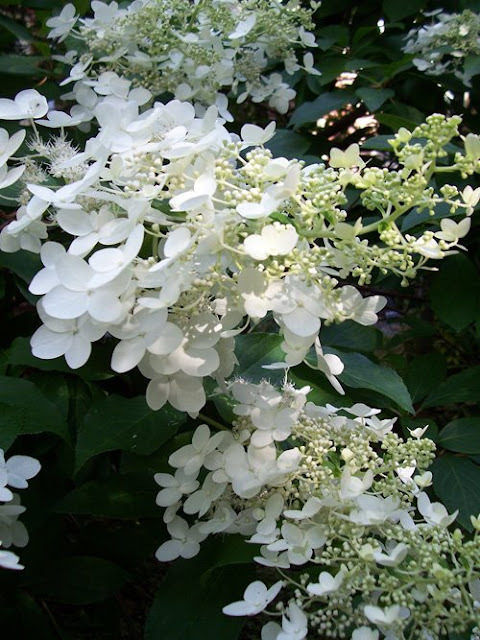 Below is the more sturdy, tree-like "oakleaf" hydrangea, which has long, cone-like floral stems. This one stands about nine feet tall. 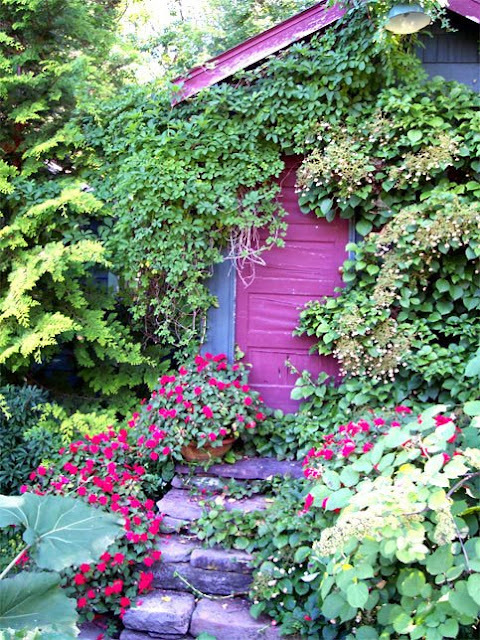 When I visited Margaret Roach's garden in 2005, her garden shed was nearly obscured by a climbing hydrangea. She's since told me that the painters who recently revamped the buildings on her property tore them all up! She wasn't too pleased. Below are photos from the Hydrangeas! Hydrangeas! website - some of the more colourful varieites. Martha grows huge numbers of the frillibet and nikko blue varieites shown here at her Lily Pond Lane house in the Hamptons. I just love the variegated blossoms on this "harlequin" variety, as well as the dark reddish foliage. The "amethyst" beside it is also lovely. These ones below are part of the "lacecap" hydrangea family. I'm not crazy about them, but they're certainly unique. i love those! we have some bushes which we got from our grandmother's garden. they are blue and grow larger every year. i like to put sibgle stems them into vases. loveley pictures! Thanks, Will! My grandmother had them in her garden too. I think every grandmother has them! You should see some of the arrangements Martha has done with hydrangeas - amazing! I have a Nikko blue and a lace wing cap that are in bloom right now. Your photos are beautiful! Thank you for sharing the hydrangea link.